We have news however about how they’re faring this nesting season. And we’re cautiously optimistic. Listed as threatened under the federal Endangered Species Act, Piping Plovers nest only on beaches, where they are vulnerable to high tides, predators, pets, and human disturbances. Only 63 pairs nested in Connecticut last year – and that was considered a good year. 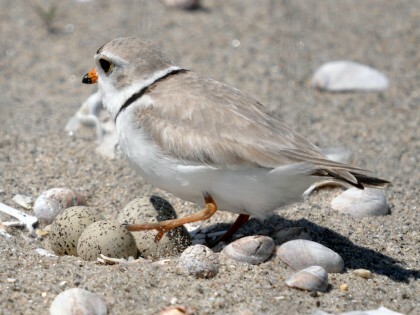 The Connecticut Audubon Society is working with its partners in the Audubon Alliance for Coastal Waterbirds – Audubon Connecticut and the Roger Tory Peterson Institute – to protect Piping Plovers on beaches from Greenwich to Stonington. All of us were concerned late last year that Hurricane Matthew might have decimated the large number of Piping Plovers that winter in the Bahamas. If that had happened, one indicator might have been that fewer plovers would return to Connecticut. But based on field reports from Audubon Alliance Volunteers, that doesn’t seem to be the case. That’s good news indeed. The New Haven Register interviewed Milan Bull, our senior director of science and conservation, and wrote about it recently. We invite you to read it here. We’ll know more, of course, as nesting progresses. The plovers that nest at our Milford Point Coastal Center are getting extra help this summer, thanks to an Important Bird Area grant that we received from Audubon Connecticut (with the help of Mike Aurelia, a member of our Board of Directors). We’re using the grant to hire Melina Giantomidis, a University of New Haven student, to work as a coastal ranger at the center for the summer. Over the longer term, Piping Plovers might be getting some habitat help. The Connecticut Port Authority is planning to dredge the lower Housatonic River later this year. The dredged material – 300,000 cubic yards of clean sand – will be shipped to Hammonasset Beach State Park, in Madison, and used to replenish a mile of beach. The Port Authority has contracted with the Connecticut Audubon Society to monitor the mile-long area for Piping Plovers starting next spring and then for the next four years. We’ll be there, week after week, from April through the summer, keeping an eye out for nesting birds. The Connecticut Post covered this story, as did the Stratford Star.